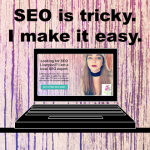 Michelle Murphy is an SEO Liverpool freelancer also providing PPC and Social Media services. No contract required. Clients of all sizes. Save 69% on SEO Agency Fees.